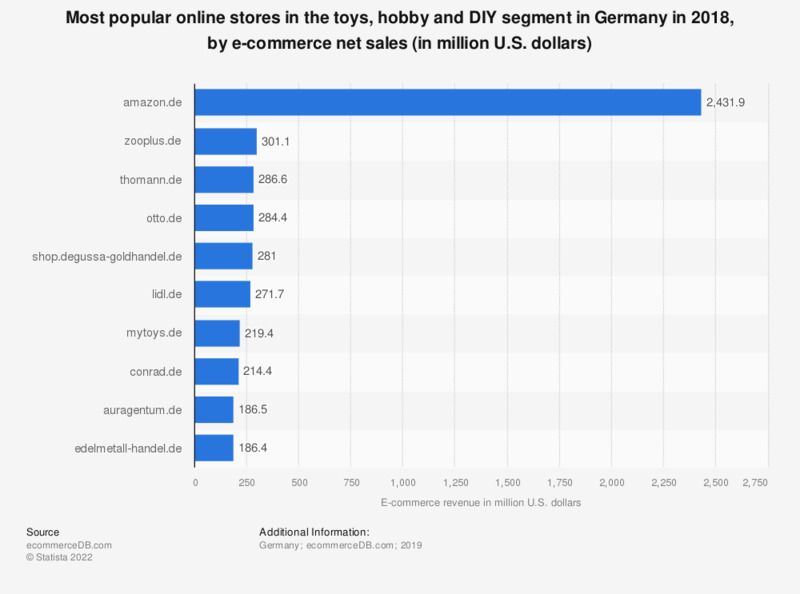 This statistic presents a ranking of the most popular online stores in Germany in the toys, hobby and DIY segment in 2018, sorted by annual net e-commerce sales. In 2018, market leader amazon.de generated 2,3 billion U.S. dollars via the sale of products from the toys, hobby and DIY segment in Germany. The online store zooplus.de was ranked second with a revenue of 320,7 million U.S. dollars. The e-commerce market category “Toys, Hobby & DIY” includes the online trade of toys, babyware (inclusive of baby food and clothing), sport, outdoor, DIY and garden products (e.g. sports equipment, outdoor equipment, flowers, plants, tools, DIY products), as well as hobby & stationery articles (e.g. art/collectors’ items, car parts and adult entertainment products).